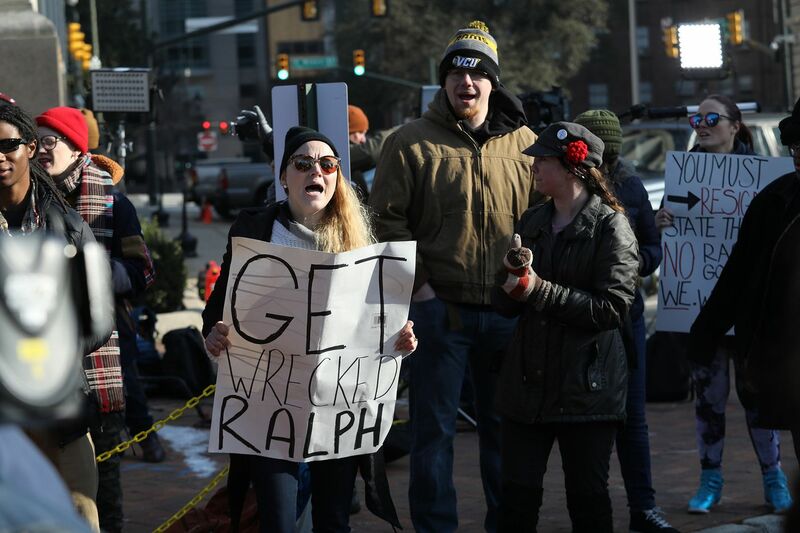 Protesters in Richmond, Va., demand the resignation of Gov. Ralph Northam over racist yearbook photos. There’s an old saying in American politics: That when you can’t say whether you were the man wearing hideously cartoonish blackface in your medical school (medical school!!) yearbook or the guy in the Ku Klux Klan hood and robe, then it’s time to start planning a different career. And yet Ralph Northam — who inexplicably clings to the Virginia governorship as I write this on a Sunday afternoon — has managed to make matters even worse in the 36 hours since the shocking discovery of the 1984 blackface/KKK photo in that yearbook photo from his obscure medical school that apparently taught future doctors some kind of hypocritic oath: First, do permanent harm to your reputation. To review: Northam came out Friday night and apologized in language that seemed to be clear that he was one of the two 20-somethings in that horrendous photo, only to wake up Saturday morning — amid loud howls for his resignation — to now insist it wasn’t him in the photo and he’d never seen it before. Northam should have resigned Friday afternoon. There’s no excuse for the racism and the seeming yukking-it-up at America’s sad history of intolerance on display in that yearbook. I’m the exact same age as Northam, and in 1984 I, too, was a 25-year-old living in a Southern state (Alabama). It wasn’t some kind of Paleolithic era — that photo was no less terrible and completely antisocial back then as it appears to us now. Indeed, I spent much of 1984 covering the Rev. Jesse Jackson’s historic presidential campaign that aimed to break down the walls epitomized by the KKK and by blackface stereotyping. And while I believe strongly in redemption and second chances — it’s critical for ending America’s mass incarceration nightmare — there’s a difference between criminal justice reform for everyday people and what’s not just expected but absolutely required for political leadership. Virginia is a big state with big problems, from the lingering racism that was illuminated by Tiki torches in the streets of Charlottesville in 2017 to the ongoing educational inequities that disproportionately hurt black kids. Northam has opened up an unfixable breach of trust in his ability to lead on those issues. But there’s something about the Northam fiasco that makes this about much more than the idiocy of one man. This weekend marks a tipping point for the Democratic Party, when it needs to quickly come to terms with its monumental failures in the area of generational change. Ralph Northam is also an avatar of decades of weak, incremental policy ideas and cowardly political calculation for the Democrats. Waiting in the wings is Northam’s electrifying successor: Lt. Gov. Justin Fairfax, who is young, gifted and black. Northam’s necessary resignation is only the beginning of how the calcified Democrats can quickly pass their flickering torch to the new generation represented by Justin Fairfax — because botching that flaming baton pass going into the 2020 election and the war against Trumpism could burn everything to the ground. Let’s start with Northam himself, because the truth is that he might have been able to survive the blackface/KKK photo if it wasn’t symbolic of the governor’s cynical approach to politics at a moment when radical change is required, The governor may have evolved on race since 1984, but not so much that he still failed to shake hands with his black opponent in Virginia’s 2013 lieutenant governor’s election. Or — even more troubling — supporters took his black 2017 running mate out of brochures in mostly white rural counties. Virginia voters could have done better in 2017. Northam’s Democratic primary opponent, Tom Periello, was clearly a more progressive choice on a range of issues from fighting climate change to expanding college access, But Virginia’s Democratic establishment, including its then-governor (Terry McAuliffe) and two senators (Tim Kaine, Mark Warner) rallied the party behind Northam — this despite the fact that Northam admitted he’d voted twice for George W. Bush for president and bragged to the Roanoke Times that “I don’t consider myself as a liberal” and that he believes in GOP-flavored smaller government. The establishment rallying behind Northam — and its fear of offending rural Appalachian whites even after most of them have long abandoned the Democratic Party — is the essence of what one could call Northamism, the tepid me-too brew of Lite Republicanism that aims to please, even as it pleases no one except a wealthy donor class. The year of the Northam yearbook photo — 1984 — was also the year of the Reagan landslide that traumatized the party for more than a generation, when — to paraphrase a song that also came out that iconic year — they ended up like a dog that’s been beat too much, until they spent half our lives just a-coverin'-up. When Northam’s baby boomer generation of Democrats did get any whiff of power, they used it too often to fill prisons with black men, “end welfare as we know it,” and become complicit in massive income inequality. That sad legacy looms over the already underway 2020 election — and it’s why this weekend’s Northam moment is so critical for the Democrats. It may be a function of name ID, but the party’s current leader for the presidential nomination is the former vice president, Joe Biden, a man of the 20th century whose politics should have died at the fireworks of millennium change. Sure, Biden’s earned some good will with his goofy “Uncle Joe” persona and his service of Barack Obama, but that shouldn’t overcome his history of cringeworthy moments on race, his treatment of Anita Hill, his history of supporting U.S. militarism, and policies that favored Delaware’s lucrative credit card companies over the middle class and that led to mass incarceration. But it’s not just Biden. Almost every major presidential candidate has to answer for a resumé with things that either seemed to look good or else escaped notice prior to 2016 that now looks like an albatross around his or her neck. That ranges from the don’t-raise-my-taxes-for-your-college-or-medicine billionairism of Mike Bloomberg (or wretched independent Howard Schultz) to the misogyny charges that dog Bernie Sanders' 2016 campaign, to Kamala Harris' record as a lock-folks-up, pro-death-penalty DA and Cory Booker’s embraces of Wall Street and charter schools. These folks became the leaders of the Democratic Party during a time when it was slow to nurture a new generation of younger leaders with fresher ideas — and as a result of those failures, the party lost 1,000 seats during Obama’s presidency. Today, these mostly baby boomers (or older) present themselves as the only ones with the resumé to take on Trump, and ask forgiveness for any past mistakes, their message is: We’ve changed, trust us. Isn’t that also what Ralph Northam is asking us this weekend? The good news for the Democrats is that the future of their party is here, and it’s ready to lead. The future of the Democratic Party is Justin Fairfax. Virginia Lt Gov. Justin Fairfax, a Democrat, stepped off the rostrum in the Virginia Senate as a member paid tribute to Confederate Gen. Robert E. Lee on Jan. 18, 2019, in Richmond, Va.
Fairfax is just 39 years old, an accomplished lawyer who ran for Virginia’s lieutenant governorship in 2017 on an unapologetically progressive platform of a $15 minimum wage, wiping out college loan debt, and greatly expanding access to health care. In doing so, he won 52 percent of the vote (Virginia holds separate votes for governor and lieutenant governor), demolishing Northam’s implication that a true liberal couldn’t win in the southern state. But most importantly, Fairfax speaks on moral issues and social justice with clarity at the moment when an older generation’s voice is muddy. Just last month, Fairfax jolted the Virginia political establishment when he left the state Senate, where he presides, and refused to participate in an annual event honoring the Virginian Confederate Gen. Robert E. Lee, calling the ceremony “hurtful” to state residents such as himself, a descendant of slaves. That’s the kind of moral authority that Fairfax will provide Virginia, and that Northam cannot. The future of the Democratic Party represented by Fairfax needs to become its present, immediately. It’s the generation that includes leaders like Stacey Abrams, Andrew Gillum, Ilhan Omar, Ayanna Pressley and Alexandria Ocasio-Cortez. These Democrats aren’t tainted by the past and they are asking the tough questions of the present — on everything from taxing the rich to supporting public schools — that too many baby boomer Democrats have avoided for too long. The paradox for the Democrats is that so much of the focus for the next 22 months will be on the race for the White House, and these leaders — who are fresh when everyone else is tired — aren’t in the mix, either too young (like Ocasio-Cortez, just 29) or lacking the resumé touchstones that we demand of a president (with Trump as an argument both for and against those invisible requirements). That’s too bad — is there anyone who really believes a Mike Bloomberg would be a better president than Stacey Abrams? — and somehow the Democrats need to work their way through the contradictions. The next week is so critical for the Democrats. Imagine a moment when Justin Fairfax takes the oath of office in Virginia as only the third African American governor in U.S. history, just as Stacey Abrams becomes the face of today’s Democratic Party by rebutting Trump’s State of the Union speech with her soaring oratory. It would be a moment of passing the torch to a new generation every bit as electrifying as when John F. Kennedy first uttered those words in 1961. But that moment can’t begin until Ralph Northam shuffles backward off the stage. He can even moonwalk — just as long as he leaves.